Manchester United managed to win back despite capitalize the limping squad at home to Watford at Old Trafford on Wednesday (03/02/2016). The victory of the Red Devils has been managed by determination of the Juan Mata's fifth goal in the Premier League this season. Shown in front of their own supporters, Manchester United controlled more in the match. However, Watford appeared the most effective than MU and they able to endanger much more of the goalpost of the Red Devils. Throughout the game, Manchester United had the ball as much as 61 percent. However, the foster care of Louis van Gaal was only able to create 14 trials to the 3 of them on the goal target. Meanwhile, Watford able to release 13 kick which 3 of them on target. Manchester United, which appeared with a limp squad because their strength has been left by 11 players due to injury, had played without a clear direction. Their coordination game not as good as the Red Devils last weekend when they beat Arsenal. The United's best chance was in the first half, when they gained the chance through the harder distance kick of Morgan Schneiderlin. However, the accuracy of the French midfielder was still a little sideways from goalkeeper Heurelho Gomes. While, Watford several times able to threaten MU, they threaten through the cooperation of a slick duo of striker Troy Deeney by Odion Ighalo. In fact, the last few times capable of facing one-on-one with goalkeeper David De Gea, only the completion of the end are still not perfect. In the second half, United began to appear more orderly and purposeful. However, Watford still played solid, and they able to make it difficult for United. Several times Manchester United were able to generate scoring chances. However, one of the biggest obstacles in the Red Devils this season, the final settlement. Only in the 83rd minute, United managed to break the deadlock over the dead ball scheme. 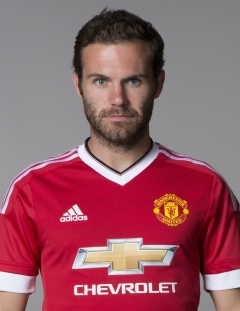 Juan Mata who has the ability to execute a free kick, successfully carry out their duties perfectly. Left behind one goal to make the players Watford increasingly look to attack. However, the United's players were able to block it until the referee ended the game. This victory means a lot to Manchester United. Because the four teams main competitors of the Red Devils in the four large zones no one was able to achieve victory at the 28th weeks. Manchester United is collecting 47 points now or equal to Manchester City in fourth place this week, they were defeated by Liverpool with a score of 0-3. However, The Citizens is still not shifted by Manchester United for the superiority of the goals productivities. Both Manchester clubs are now four points behind Arsenal, who finished third in this week also suffered a 1-2 defeat of Swansea City at home.